I think everyone needs a really good, really easy pound cake recipe. I have been making this pound cake for years. It’s the one my mom used to make when I was a kid, so of course it’s my favorite. I use it for strawberry shortcake, and for several types of trifle, including my raspberry cheesecake trifle. I love using it for trifle because it is dense enough to hold up to the pudding and berry juice without getting all soggy like a cake mix cake does. You can change the flavor by switching the flavor of extract you use. For extra lemon flavor, you can even throw in some lemon zest if you like. It always turns out moist and delicious! 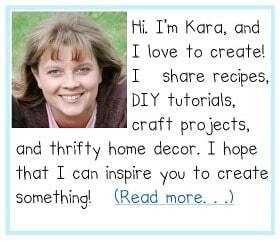 This recipe does contain affiliate links. I only share products that I use and love! 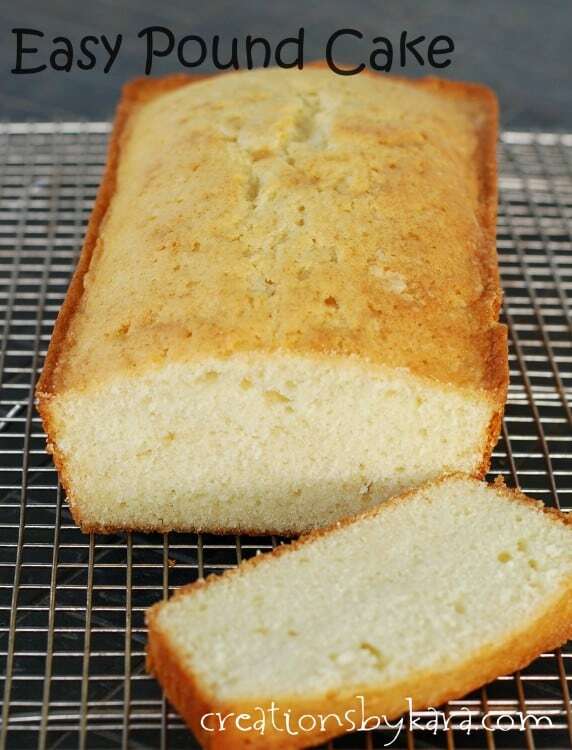 Simple but delicious pound cake made in a loaf pan. Perfect for strawberry shortcake and trifle! Cream butter and sugar till light and fluffy. Blend in milk and extract. Sift dry ingredients together and add. Beat till smooth. Bake at 300° for about 90 minutes or until a toothpick comes out clean. Cool for 5 minutes, then remove to a cooling rack. Cool completely. Stay tuned, later this week I will be sharing a recipe for Strawberry Trifle that features this yummy pound cake! I’ve never tried making it into cupcakes, but I think it would work just fine. Not sure on the time. I’d start with 20 minutes and add more time as needed. Let me know how they turn out! 4th time I made this awesome recipe,I bake a lot always looking for a easier way to make things and still have great taste. This is great and so easy,having it with strawberries and whip cream after church tomorrow can’t wait.Thanks for this fabulous recipe. Omg I made this Friday for strawberry shortcake and it is amazing. This was the first time I have ever made a pound cake. My husband was very impressed. Will definitely be making this again. Yay, I’m always glad when a first timer has success! So glad you loved it. I haven’t had strawberry shortcake for ages, I need to make it soon! 300° for 90 minutes. If you have a convection oven it may cook faster. Just took out the oven! Was quute xonxerned at such a low temperature oven for an extended period od time but the house smells nice!!! Made this last night. Easy and delicious. Great for strawberry shortcake. Will definitely make this again and again. HI…Just ran across your recipe for pound cake. Do you use butter or margarine? If butter is it salted or unsalted? Can’t wait to try it. My daughter loves pound cake but I haven’t found a recipe that holds up to the toppings we put on them. I use regular salted butter in all my recipes. This pound cake does seem to hold up to any toppings we’ve tried. Hope you like it! Will this rise quite a bit? I just made this. Oh my was it delicious! I made mine in a square stoneware baking dish and baked it at 325 degrees for 40 minutes. I made mine with the lemon extract and it was perfect with our fresh strawberries. Mine is in the oven right now. I’ll let you all know how it comes out! Update: It came out FANTASTIC! VERY happy with this recipe (making 2 more tomorrow)! Made this pound came for Easter dessert, strawberry short cske. It is the EASIEST & best tasting pound cake I have ever had! So buttery, moist & yummy. Went well with the strawberries & whipped cream! You gotta try it! So glad to hear you liked it as much as we do Kathy!! Does it use self rise? Nope, just regular all purpose flour. Could I use a bunt cake pan instead of a bread pan? Sorry I just saw your question. I don’t think it would be enough batter for a bundt cake pan. Maybe if you made 1 1/2 times the recipe it would work, but I’m not sure how long it would need to bake. You could always try it though! I love how easy this recipe looks and can’t wait to try it. I’ve read comments that it’s moist (which is great) but I want to try to make the Pioneer woman’s ice cream layer cake which uses pound cake, and I thought for that it would have to be more dense because it requires slicing in thirds and then adding ice cream to it? Any thoughts on that? Should I increase the baking time? I thought pound cake is usually dense anyway. Made it and it held up great. Thank you for sharing this wonderful recipe. So easy. I made this tonight for strawberry shortcakes and I didn’t want to wait the 90 minutes so I baked it in a 9″x13″ cake pan at 350 degrees for 25 min. It’s so moist and delicious and we haven’t even made the shortcakes yet! Thanks for such an easy, yummy recipe! Glad to hear they turned out! I love the idea of making cute little individual shortcakes! I found your recipe on Pinterest, I used it because hubby was having a craving for simple pound cake, I liked it because it only requires 3 eggs (others are 5+). I love baking but haven’t made pond cake in forever, lol. The recipe is easy to follow. I am currently baking my 4th batch, needless to say it’s a huge hit. Tonight I am trying it with cocoa powder. Thank You! This recipe is great! I made it today, doubling the recipe and it turned out perfect…I am using it to make a trifle, and my husband wanted to taste the cake–three pieces later, he left me the rest for the trifle. (Good thing the trifle only needs one and a half loaves!) Thanks again for a simple, yet incredibly tasty recipe! Haha! At least you only had one taste tester. I have to fight off teenage boys! 😉 Glad you both liked it! Could be use for cupcakes? I’ve never tried making cupcakes with the batter, but you could certainly try. I’d set the timer for 20 minutes, then add more time as needed. Good luck! Can you add cocoa to this pound cake? I have never tried adding cocoa, but I would bet that you could add it with the dry ingredients. If you try it, let me know how it turns out!